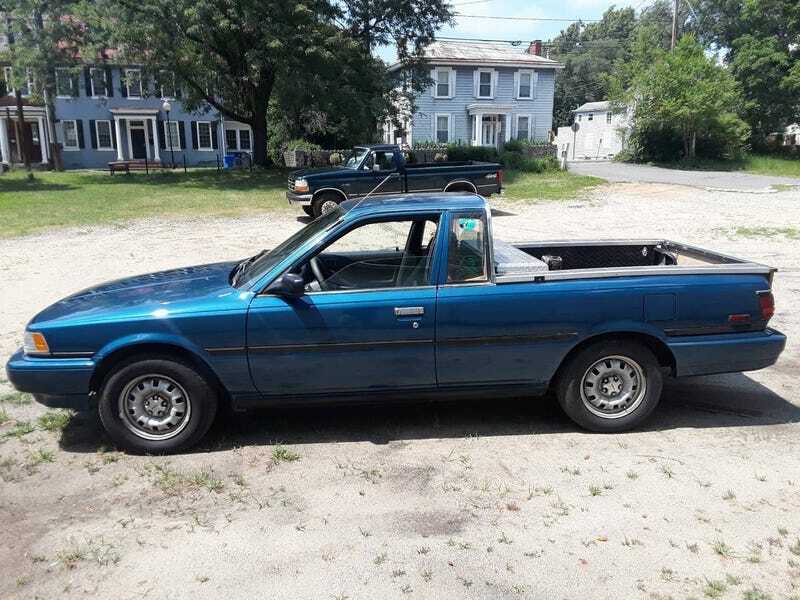 At $2,900, Might This Converted 1991 Toyota Camry Pickup Convert You Into a Believer? The Camry may be one of the most utilitarian cars around, but as today’s Nice Price or Crack Pipe pickup proves, it could always work a little harder. Let’s see if this custom car-truck’s price works for you. Close by no cigar is a phrase not bandied around all that much anymore. I attribute its diminished popularity to decades of effective government anti-smoking campaigns, collateral damage if you will. Maybe in the future people will say, close but no Juul. That’s all too bad, because the vote on yesterday’s 1987 Audi 5000 CS Quattro Turbo Avant came in at a remarkably tight 50.53-percent Crack Pipe loss. That means that its $4,500 price was close but nobody’s getting a stogie on this side of the fence. Speaking of fences and old school apothegms, you’re no doubt familiar with the phrase, the grass is always greener on the other side of the fence. It means that people are oftentimes envious of what others have, in indifference to the attributes they themselves might possess. The builder of today’s custom 1991 Toyota Camry pickup obviously suffers no such foible as he has followed another maxim which is to make do with what you have. What we have here is a Camry which, based on its tail-lamps, seems to have started life as a sedan. At some point in time, the current owner decided that wasn’t cutting it, so he cut the whole backend off, right above the waist. As part of its pickup-ification, the owner removed the rear doors, handles and all, and created an extended cab passenger compartment with a reasonably well-finished feel. The only place where this conversion feels half-assed at all is in the tailgate, which appears to be a flat piece of diamond plate stretched over the corner caps in an awkward manner. The sides of the bed are also diamond plate, and there seems to be some wood involved in the construction as well. A bed-mounted tool box returns some of the secure storage capabilities lost when the carve up its trunk. The whole thing is painted in a fresh coat of metallic blue and, aside from everything from the B-pillar back, seems stock and tidy, right down to the factory steel wheels. The interior, or what’s left of it at least, seems equally unremarkable. The grey fabric seats are holding up their end of the bargain, as is the carpet and dash. The only thing we could dun the seller on here is a bit of door seal that’s come loose from its moorings. Get back, Loretta! Mechanically, things seem to have not strayed too far from Camryland either. The 2-litre, 16-valve four has new belts and a water pump refresh, plus new injectors, because who doesn’t like that? The ad says the car comes with 93,000 on the clock, but doesn’t detail how far into those miles the chop job took place. The four-speed automatic has overdrive and a lockout switch on the shifter so you’l have something to play with at the stoplights. What, am I the only person who clicks O/D switches when I’m bored? There’s a clean title and I’m sure, a story to tell that goes along with this presently 2-owner car-truck. There’s also the matter of its $2,900 price tag which we are all now going to evaluate. What do you think, is this clean custom worth that kind of cash? Or, is that just too much for a car that’s less than it used to be? H/T to BenLikesCars for the hookup! Is This 1987 Audi 5000 CS Quattro Turbo Avant Old School Cool Enough to Ask $4,500? At $13,500, Would You &apos;Pickup&apos; This Custom 1979 Chevy Corvette? At $7,650, Is This 1984 VW GTI a Hot Hatch or a Hot Mess? At $19,000, Could This Amazingly Low Mileage 1985 Toyota Celica Supra Make The Grade? At $4,500, Might This 16V 1983 VW Caddy Tee Up Some Good Times?